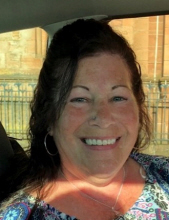 Her Legacy…Elaine Janet McLeish-Pierzinski, age 62, passed away April 4, 2019. She was born on June 7, 1956 in Newcastle, Scotland to Frank and Isa (Fleming) Harrison. Elaine married David Pierzinski on August 19, 1994 at Holy Spirit Catholic Church in Hamburg. She has resided in the Hamburg area for 38 years, and served at Zukey Lake Tavern for many of those years. Elaine’s world was her family, she loved being a wife and treasured being a grandmother and great-grandmother. Elaine adored her family and enjoyed spending time with them. She will be greatly missed by all who knew and loved her. Her Family… Elaine will be missed by her husband, David Pierzinski, her children, Elizabeth Blays, Carol Blays-Craddock; siblings, John (Aileen) Harrison, Frank (Linda) Harrison, Gordon (Sue) Harrison, Julie Harrison; grandchildren, Casey, Chelsea, Aaron, Andrew, Paige, Presslee, Austin; great-grandchildren, Shailagh, Angelina, Talia, Isaiah, Arrianna, Cortez, Jessinia, Casey, Carmen, Colton, Delaney, Jayleen, Hadley; siblings-in-law, Denise (Joe) Lonchar, Douglas (Derrenda) Pierzinski, Daryl (Shelly) Pierzinski, Deidre Hatchard, Darius (Lynn) Pierzinski, and several nieces and nephews. She is preceded in death by her parents, Frank and Isa Harrison; grandson, Casey Blays; mother-in-law, Eleanor Ann Pierzinski. Her Farewell… Elaine’s family and friends will gather 2-8PM, Tuesday, April 9, 2019 at Borek Jennings Funeral Home, Hamburg Chapel. Her Community Farewell will be held at 11AM on Wednesday, April 10, 2019 at Shalom Lutheran Church, 1740 M-36, Pinckney, MI. Family and friends will gather from 10AM until the time of service. Pastor Kurt Hutchens will serve as celebrant. Memorial contributions may be given to family for future designation. Please leave a message of comfort for Elaine’s family at 1-877-231-7900, or sign her guestbook at www.borekjennings.com. To send flowers or a remembrance gift to the family of Elaine J. Pierzinski, please visit our Tribute Store. "Email Address" would like to share the life celebration of Elaine J. Pierzinski. Click on the "link" to go to share a favorite memory or leave a condolence message for the family.